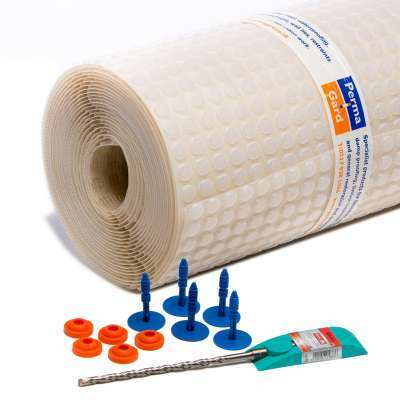 This high quality damp proof membrane kit contains all you need to protect internal walls against damp & the reappearance of salts. It is specifically designed for application on to damp walls to isolate them from new finishes. Read our Causes of Damp Guide and our How to Complete Internal Damp Proofing for more on damp proof membranes and resolving issues with damp. Very easy to use and looks as though it will do the job. Excellent customer service too. 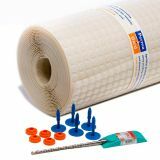 At Permagard we listen to our customers, due to customer reviews and feed back of our damp proof membrane kit we have increased the amount of plugs supplied up to 200 now with seals! Please keep the reviews coming so we can continue to make our products even better! this is a good quality kit,and it works. however i found an 8.5mm drill bit was needed,any smaller and the plugs dont go in,the plugs are a little flimsy and bend,unless the hole is big enough. needs fixing every 120mm i find or it feels loose against the wall. you will need another bag of plugs with the kit. but all in all im happy with this product,and being a professional damp proofer/renovation company,i can see us using this over cement based tanking. I was expecting the job to be difficult and time-consuming but I was pleasantly surprised.It was the first time I had used a kit like this before but it was so simple and easy to complete. Fast delivery too, cheers. just re done someone else's poor work, damp proofing failed, they drilled and rendered the walls but damp came back as they didn't do it correctly, i've just chopped off there work and re drilled and injected myself, fitted the above kit which was easy to cut to size and use on my own, first time i'd used it as well tbh. gave the customer a option of wet plaster or dot and dab and they went with the dry solution which can be decorated sooner, fixed really well, could have done with some more fixing for me in the kit but then again i like to use plenty, loads of mastic, so maybe one tube of mastic less and more fixing? wished i'd had this years ago, could have saved me loads of time and seems to be a lot better job, as im the one who will be also decorating and putting skirting back, this is quicker and for me loads better, clean and hardly any waste, apart from one tube of mastic left, as long as you remind the plumbers and other trades to mastic any holes they drill into it afterwards rads etc, can't see this going wrong in my life time.